There are a variety of pesticides allowed for organic pest management. As in conventional production methods, pesticides should be used as part of an integrated pest management program. All pesticides, whether approved for organic use or not, are intended to repel, harm, or kill living organisms. As such, they can pose risks to the applicator, the crop, and the environment if they are misused. Follow label directions and pesticide laws and regulations. Additional Personal Protective Equipment (PPE) can be used as needed or desired, if it does not cause heat stress. Information on the Worker Protection Standard can be found here. Refer to other modules within the Pesticide Environmental Stewardship website for more information on proper pesticide storage and disposal. No one applying a pesticide – organic or otherwise – should make the incorrect assumption that they are using a “safe” pesticide. The toxicity of a pesticide depends on what is being evaluated – short-term or long-term toxicity – and who or what may be affected (e.g. applicators, farmworkers, livestock, wildlife, pets, birds, fish, beneficial insects (such as pollinators, see below), earthworms, sediment-dwelling organisms, crops). Toxicity is not the same as risk, which is dependent on both toxicity and exposure. Following all label directions and precautions will ensure that exposure is managed so that toxicity is not a concern. 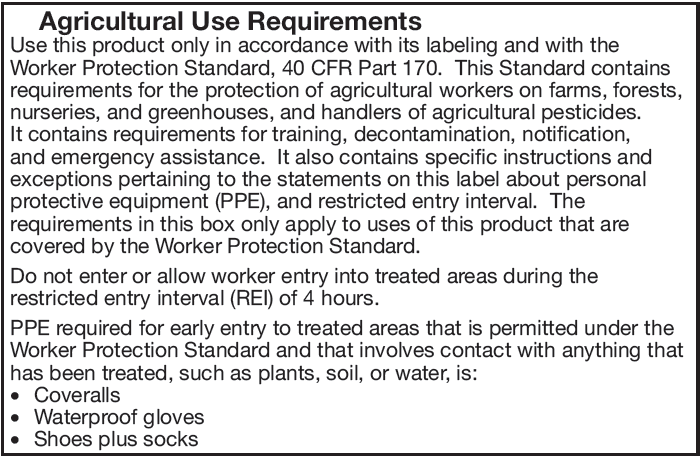 For example, the label of a pesticide product that may cause skin irritation will also contain requirements for personal protective equipment that safeguards the skin, while a product that may affect fish will contain use directions, precautions and possibly even restrictions intended to protect fish. This is why the EPA-approved label instructions must be followed. Some pesticides approved for organic production can cause harm to bees and other pollinators. 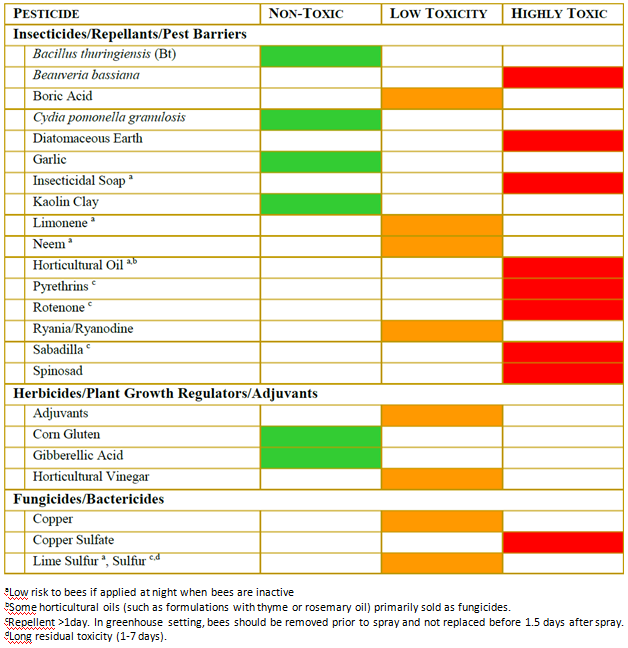 The Xerces Society for Invertebrate Conservation provide the following table entitled “Toxicity of Common Organic-Approved Pesticides to Bees” from the fact sheet, Organic-Approved Pesticides–Minimizing Risks to Bees. Additional pesticides approved for use in organic agriculture may adversely affect bees. For more information on how to protect bees, visit the Pollinator Protection module of the Pesticide Environmental Stewardship website. Over-use of a pesticide, or incorrect application timings or rates (too high or too low), can also cause problems, such as the development of resistance by the pest (see label statement from a pesticide approved for organic production below). If multiple applications are needed to control the pest, try to rotate the pesticide to one with a different mode/target site of action (MOA). For example, growers with fire blight should rotate streptomycin with other pesticides, such as copper. All pesticides have a MOA and many resources exist to determine what it is. Refer to the module on Pesticide Resistance in the Pesticide Environmental Stewardship website.